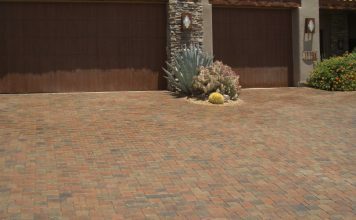 The Outdoor Floor: Our Scottsdale & Phoenix pavers and stone paving work. 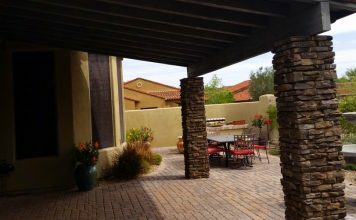 Where was this Scottsdale outdoor living space increased? 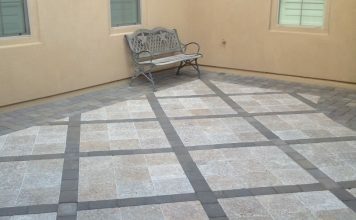 Pavers allow for seamless patio extension. A long front walk up a steep incline calls for something different when it leads through a gorgeous xeriscape garden. It's not often you can add something to your home that looks awesome for decades without any touch ups or repair needed. 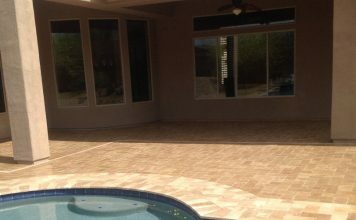 Visually enlarge the backyard by including the back porch in your Phoenix pavers treatment on both pool deck and patio. 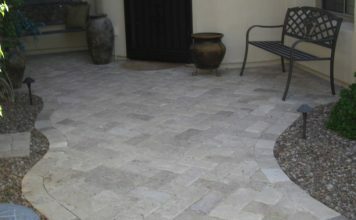 This new patio gets gorgeous color and subtle pattern from Noche Travertine pavers. The adjoined pool deck was done in a blend. With a little imagination courtyard flooring looks more like an area rug than pavers. 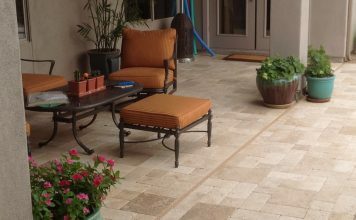 The beauty of travertine plays against dramatic dark pavers. 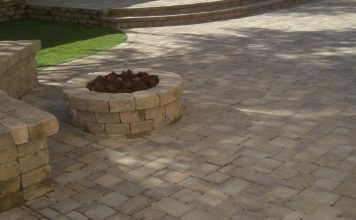 There are a number of ways to use pavers in Scottsdale landscaping besides patio paving, like steps, firepits and low retaining walls too. A small courtyard we've made look more spacious with a monochromatic raised planter and pavers. It's understated, yet lovely. 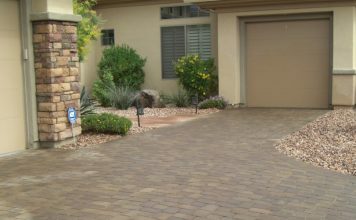 Even the most beautiful home has far more aesthetic value with driveway pavers. 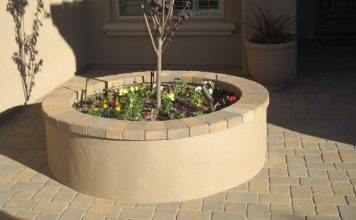 In Phoenix - Scottsdale areas its instant curb appeal plus. 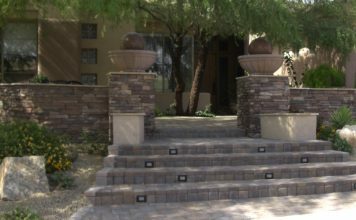 Welcome visitors to your home with Scottsdale pavers for sidewalks, driveways and pavement accents. Tying old and new features together. 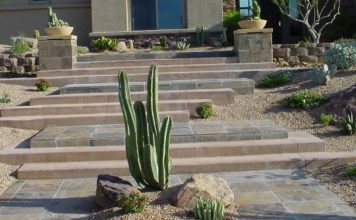 Create a grand welcome and curb appeal with unique stone masonry and Phoenix pavers in front yard Arizona landscaping.